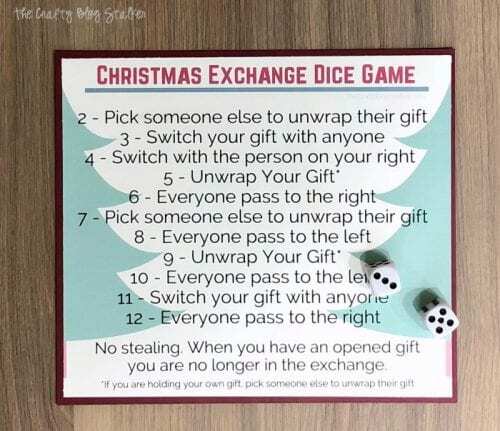 A fun Gift Exchange Dice Game for Christmas Parties. Tutorial includes free printable dice guide. Great for large groups. Easy DIY Craft Tutorial Idea. Every year my family gets together for a BIG Christmas Party. And when I say big, I mean 40 plus people! That is what happens when everyone gets married and has kids of their own. Our family with 7 kids has turned into quite the gathering! This year I was in charge of the gift exchange, my favorite task! Of course, I had to make it fun! Before the party, everyone was asked to bring a gift with a $10 to $15 limit, and the girls bring a girl gift and the boys bring a boy gift. This is the easiest way to keep it even and make sure a boy doesn’t go home with makeup that he probably won’t use. Have everyone bring their gifts marked for a girl or for a boy. Ask everyone to sit in a circle with all of resents in the middle. Tell everyone to get a gift from the middle and sit back down. The girls grab a girl gift and boys grab a boy gift. Making sure that the gift isn’t the one that they brought. There is no need to separate the girls from the boys, everyone can sit where they want. Just remember when a girl rolls the dice only the girls to the action. The boys wait until it’s a boy’s turn to roll the dice. Start with the oldest or youngest member of the group and let them shake the die. Then do whatever the number tells you to do! Keep passing until everyone has opened a gift. 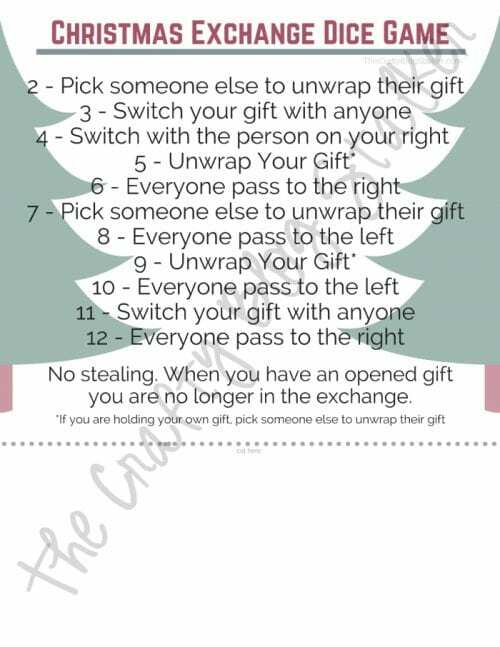 There is no stealing in this gift exchange game, so when you have opened your gift you are done and no longer roll the dice. This game is a lot of fun to play and is a great variation to gift exchange games! 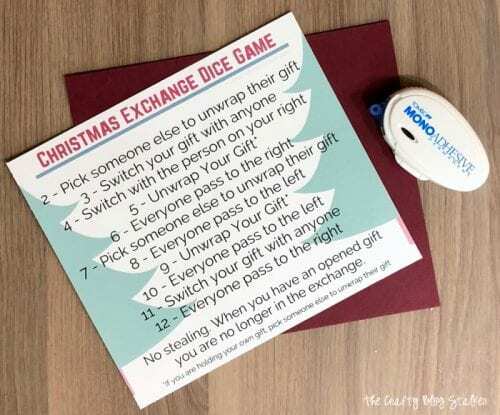 I have included a free printable of the Christmas Exchange Dice Game so you can play at your next party too! Simply the picture below to download. The printed version won’t have the watermark on the front. I printed on white cardstock, trimmed and glued on top of a red piece of cardstock to make the card nice and sturdy for passing around. Another fun game we have played at our family Christmas Party is the Naughty or Nice Christmas Game. This was a lot of fun too! What is a fun Christmas game you have played with a large group? Share and leave a comment below! 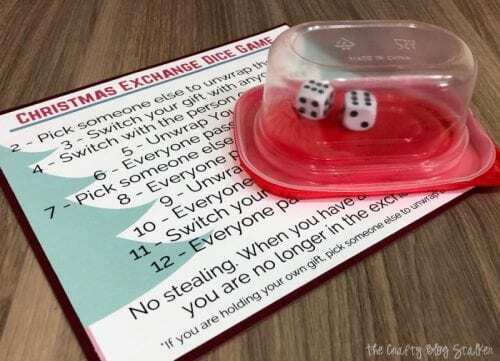 SAVE CHRISTMAS GIFT EXCHANGE DICE GAME WITH FREE PRINTABLE TO YOUR FAVORITE PINTEREST BOARD! so when is it the boys turn if a girl starts? We sat in a big circle and the dice always traveled to the right. If a boy rolled the dice, the boys took the action or same if a girl rolled the dice. Or if you like you could go every other one. Thanks for the great question Rose!